An anti-Earth Hour group urging Australians to keep their lights blazing this weekend is a sign of waning interest in environmentalism, experts say. The global Earth Hour movement – founded in Australia in 2007 – is asking people to switch off their lights for one hour on Saturday night. But a Facebook group is urging people to "keep every light you own running during Earth Hour". Some of us are going to Etihad Stadium at Melbourne's Docklands to watch the AFL football match between St Kilda and Sydney. The mind boggles as to the carbon contribution of all those lights. Bringing back more daytime games would be an unlikely solution. Bad for television, bad for sponsors. Money makes the world go ... Another local sporting event this weekend is the Grand Prix at Albert Park. Noise and carbon pollution! Did our bit in 1996 when the lights went out two thirds of the way through a night game between the Saints and Essendon at Waverley Park. They played the remainder of the match during the week. We still lost! We're feeling holier-than-thou as we had solar electricity installed this month. A bit useless at night but thanks to the government for the subsidy. I'm usually into symbolic gestures or tokenism (depending on which side of the skeptical chasm you stand). Anyway they can turn the lights out tonight if we're getting beaten. It was a relief in '96. The setting for Gran Torino is the Global Financial Crisis' 'Ground Zero': the suburbs of 'Motor-City' Detroit before the worst of the sub-prime meltdown. I didn't review Gran Torino when it was first released because I was disappointed with it. It deserves big ticks for: good acting; a tight script and topicality. But the crosses are a lot to bear from such great filmmakers: lack of originality; pedestrian predictability and a dearth of insights. Going by the box office and its continuing presence in Australian cinemas I seem to be in a small minority. AUSTRALIA'S third-largest internet service provider yesterday announced it would not participate in the Federal Government's trials of an internet filter, saying that to do so would conflict with its "corporate social responsibility". If you're interested in the discussions then link to the Whirpool forums. P.S. This blog's traffic is being monitored to see who's watching. Jessica Biel is the best thing about this film. She plays Larita, the unwelcome addition to the English upper crust Whittaker family. Jessica hits just the right note in a version of Noel Coward’s 1925 play that seems off key in many ways. She has the look required of a rally-driving femme fatale, with strong features and typically American teeth. As well she shows the talent to make a bigger splash in the Hollywood star pool in the near future. The end of Work Choices! Congratulations Julia! Also to Greg Combet and the other true believers who said we would defeat Howard's industrial relations misadventure. And to Emily and Terrina who are featured in the video. 24 November 2007 seems so long ago. My tip for tomorrow's Queensland election is Labor by one seat, anything else is unthinkable. There has been no evidence that a LNP government would be any better than the old Country Party. To all those Green voters, please use your preferences. Identifying the economic woes of the United States is crucial. But we should also understand that other countries are also grappling with bankrupt companies and shrinking economies. Many countries are also implementing their own stimulus plans. What are some of the examples used by bloggers around the world when they discuss the bubble economies, bailout of banks and stimulus plans of their countries? -- changes in the job market, job preparation. Please leave any suggestions in Comments. It will be fascinating to see how many Americans take to the streets to Take Back the Economy. Demonstrations are planned in over 100 locations on 19 March. Found an interesting link: Brave New Films one of the national sponsors of the protests. My Queensland ferret, who calls himself an ALP offsider, refers to them as the Victorian AFL diaspora. These Southern immigrants follow the alien form of football but live in that Rugby League dominated State. Many are economic migrants who followed the mining and other booms North over the last forty years or so. Many others are retirees, in their place in the sun. The famous Gold Coast, centred on Surfers Paradise, is their epicentre. These heathens helped to make the Brisbane Lions AFL premiers 3 years in a row. They are now waiting to have their own team in an upgraded stadium at Carrara. So what’s the connection with the State election on Saturday? Well, the government support helping the stadium with $60 million but the leader of the Opposition, Lawrence Springborg, is strongly opposed. You don’t find many Aussie Rules fans in his traditional rural and regional heartland. … Liberal National Party (LNP) Leader Lawrence Springborg conceding he may have lost some votes on the Gold Coast. Mr Springborg says he supports having an AFL team on the Gold Coast, but says upgrading a stadium is not as important as other issues. It could be his political health that's threatened if the election is as close as the polls are predicting. Government will be won or lost in the South East. The recent elections in the Northern Territory, Western Australia and the Australian Capital Territory showed how important a handful of votes can be. As Mudgeeraba Labor MP Di Reilly, sitting on a margin of just 2.7%, remarks with some understatement in today's Gold Coast Bulletin: "this is a gift that goes on giving". The oil spill on the other holiday/retirement coast has been a bit of a distractor. Gave new life to the old cliché about a week in politics. CLIVE Palmer has poured his first dollars into the LNP in a late boost to the Opposition's campaign to bring down the Bligh Government. In the same week that he dined with US President Barack Obama, Mr Palmer made his first donation to the LNP since it was formed from the merger of the Nationals and Liberals last August. Liberal National Party candidate Michael Palmer was today asked to leave Brisbane's Queen Street Mall after he was spotted handing out election flyers. Apparently the nineteen year old was distributing leaflets against the government funding of the stadium. The safe Labor seat he’s contesting is not on the Gold Coast. With Queensland’s use of optional preferential voting, the administrators of the Australian Football League may have a tense wait while the votes are counted. P.S. Apologies to the architects of the amalgamated party. I keep reversing the name. Too many years of the Country Liberal Party in the NT. The ghost of Joh Bjelke Petersen still lingers. I preferred the simpler days when his Country Party was running everything up North. We knew who the enemy were then. The channel appears to belong to the ALP. It is authorised by A Chisholm ALP 16 Peel St South Brisbane. Anthony Chisholm is the State Secretary. The state government has accused Sunshine Coast MP Mark McArdle of retaining links to a disgraced lawyer whose firm cost investors $30 million in failed mortgage schemes. Mr McArdle, the Liberal leader, was a partner in Sunshine Coast law firm Boyce Garrick lawyers when scores of investors, mostly elderly retirees, lost money in the 1990s schemes. It seems all stops are out. I wonder if they'll use it on television. UPDATE: My QLD ferrets tell me that the ad is on TV. If you didn't hear today's ABC Radio National's Background Briefing, Conroy's Clean Feed, download the podcast or listen to the repeat on Tuesday on Tuesday 17 March at 7pm. In the name of protecting children, the government is investigating ways to filter 'unwanted' and 'inappropriate' material on the web—seen by some as the thin end of the censorship wedge. Senator Conroy's Future Directions of the Digital Economy blog has been silent for nearly 6 weeks. Couldn't find anywhere to leave a comment anymore. As ABC reporter Wendy Carlisle remarked, the Minster for Communications isn't always that communicative. At one stage during the report he tells us that the trial is only about technology - the debate about what will be blocked will take place later on. I would be delighted to be corrected. The Federal parliamentary internet feed is currently censored. Background Briefing has a couple of examples. One has upset anti-abortionists including Liberal Senator Cory Bernardi. Anyway with Nick Xenophon and the Liberal Party right opposed, Conroy and Kevin Rudd should save the money and redirect it to employment programs. This post is an attempt to describe the social impact of the great financial crisis as seen and felt by ordinary citizens around the world. Who’s watching the Watchmen is one of its themes. Apparently lots of people are, if early box office is any indication. Others can buy into the disputes between the filmmakers and purists of DC Comics about this story of comic book heroes. The graphic novel hasn’t been my preferred genre since the 1950s but I have enjoyed some of the film adaptations of the less well known super heroes and villains such as Sin City, V for Vendatta and Iron Man. Perhaps the best of the recent ones was Hell Boy. If you’re tired of Batman and Spiderman retreads, then this could be the movie for you. If you’re a fan of the comics, then you might want to wait for an extended director’s cut due later in the year. Too much is obviously not enough for some people! I've been talking to some Queensland ferrets about the State election. Current call by one ALP outsider is a 4 seat majority to Labor. Feeling is that the South East, especially Brisbane won't bring themselves to elect Springborg Premier. But will they remember that he's really National Party despite the re-branding? Haven't seen a breakdown of the latest poll giving the LNP a 2% break but suspect the lead could be weighted towards the bush and regions. The old Beasley 1998 majority in the wrong seats syndrome. After the WA debacle anything is possible. It seems that solid but boring government isn't enough. The electorate are looking for blood. Factional pre-selection skulduggery and a lack of an articulated vision by Premier Anna Bligh apparently aren't helping. Not to mention the elephant in the room - the economic crisis. 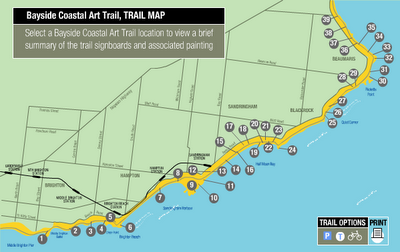 Click the map to visit the Bayside Coastal Art Trail. It's a project of the Bayside City Council. It's one of Melbourne's local council areas on Port Phillip Bay. The cliff tops and beaches of the Bayside area have provided inspiration for many writers, sculptors and painters, most notably the Heidelberg School. Over three years Bayside City Council has developed the Bayside Coastal Art Trail covering 17 km of one of Melbourne's most picturesque coastlines. The Bayside Coastal Art Trail seeks to celebrate the lives and artwork of notable Australian artists who painted the Bayside coast in years past and maps an important part of the area's cultural heritage whilst enhancing the enjoyment for present day visitors to the coast. If you can't walk the trail then just enjoy the virtual art tour. Unless you’ve been in coma for the last 8 years, it is impossible not to have an opinion about George W. Bush and his years as leader of the “free world”. W. was a disappointment as a president. In many ways so is the movie movie W. Oliver Stone has presented the George W. Bush most of us know about. Drunk, wastrel, drifting from job to job, living in dad’s and brother Jeb’s shadows. Then AA, born again Christian, family man, successful Texas Rangers baseball team owner, Texas Governor and finally the ultimate office. His early life as the black sheep of the Bush clan transformed into a remarkably successful electoral career after becoming Governor of Texas in 1994. His actual achievements are more contentious. I can’t bring myself to read the intimate details of W.’s White House or his family life so others can argue about the accuracy of his backstage life. Given Stone’s notorious tendency to make-believe, National Security Council meetings may not have finished with a prayer. Cricket, that shared legacy of British colonialism, has taken centre stage in Australian blogs following the terror attack in Lahore. ... This terror attack has taken bushfires off the front pages of Australian newspapers and the lead stories of the electronic media. Many Australians will guess which blogger had already decided the religion of the terrorists before they had been identified. If you're not sure then a visit to his "stalkers" at Pure Poison is highly recommended. The new Australian film The Combination is getting international attention. Haven't had a chance to see it yet so my review will have to wait. The Reader is a complex film that explores themes of love, barbarity, guilt, shame and secrecy. The triumph of the human spirit is often hard to find as the horror of the holocaust is revisited through a different lens, a seemingly ordinary but very flawed German woman. There are many ghosts haunting this excellent movie besides its holocaust victims. Twenty five years ago Meryl Streep won a Best Actress in a Leading Role in Sophie’s Choice. Kate Winslet took the glittering oscar prize this year in competition with Meryl’s outstanding portrayal of Sister Aloysius Beauvier in Doubt. Sophie and Hanna both have secrets that embody the mystery in each narrative. In Hanna's case her personal shame takes precedence over public condemnation but her secret is barely disguised from early on in the film. We are warned by a teacher's remarks that literature is about characters trying to keep their secrets hidden. Amon Goeth, the crazed commandant from Schindler's List was played by Ralph Fiennes. He received a nomination for Best Actor in a Supporting Role. The Academy of Motion Picture Arts and Sciences certainly like holocaust movies.